All houses wherein men have lived and died are haunted houses. Which could be qualified of impersonating some character. Later I saw The Little Girl Who Lives Down the Lane while eating almonds that weren't already bittersweet. It's the only movie with Jodie Foster I saw and liked. Almonds possess a beta-glucosidase that is activated on contact with air, and produce hydrogen cyanide, but is "inactivated" by gamma rays, etc. if I understood (and translated myself) clearly, which I'm doubtful I did, and has little to do with the movie. I wonder if one could habituate oneself to cyanide by eating one quarter of bittersweet almonds per day, then one half bittersweet almond per day, and so on, cautiously, as to higher their "here I'm intoxicated" line? Also, there is that character in Spirou which is called Cyanure. I walked my narcissic self in and near the park. 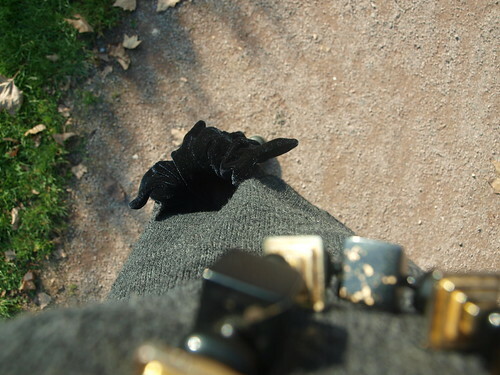 Grey long sweater: gifted; blue beret (real basque, made in France), black velvet gloves, necklace: thrifted; black pleated miniskirt: Fabio Lucci. Reading some people blogs you may think that everything you wear must have a meaning. It's more or less wrong in that case. There are things behind and in the past that might have influenced me in choosing what to wear, and there was an atmosphere I wanted (a certain mood), but I didn't consciously thought that it meant something. 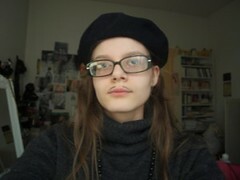 I've been influenced and inspired by a picture of Kate Moss wearing a too long (and too large) sweater over a miniskirt in the 90s, the old cliché of beret and black-wearing artists with a lean silhouette like you drew it fastly with a 9H pencil, my idea of cosyness, calm and late year (wintry, automnal) isolation which itself had been influenced by images and definition of cosyness I encountered through my life. Trying to explain one's outfit's "mood" feel a bit stupid, and I fear being mocked by random people reading it without care, but what I want to say is when people explain what inspired their outfits, they only tell the "upper-ladder" inspiration even if they dig to remember the others. It might be the same with everything we do in our lives and our reasons to do that, and here personal history and not only culture would count as "inspiration". What's your opinion about that?